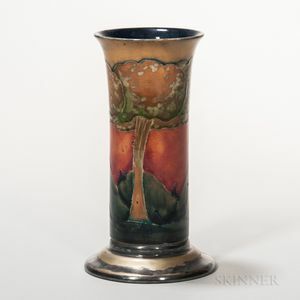 Moorcroft Pottery Eventide Design Vase, England, c. 1925, cylindrical shape with flaring top and silver-plated foot, enamel decorated treed landscape, signed and impressed marks, ht. 7 3/4 in. Silver plating worn to foot. No evidence of any cracks, chips or restorations.